— high bond bars, fbd = (2.25fctk 0.05)/*c where fck and fctk 0.05 are as defined in Chapter 3.1. (3) In the case of transverse pressure p in N/mm2 (transverse to the possible plane of splitting) the values of Table 5.3 should be multiplied by | 1/(1 - 0.04 p) d 1.4 |, where p is the mean transverse pressure. P(1) The basic anchorage length is the straight length required for anchoring the force As.fyd in a bar, assuming constant bond stress equal to fbd; in setting the basic anchorage length, the type of the steel and the bond properties of the bars shall be taken into consideration. Values for fbd are given in Table 5.3. (3) For double bar welded fabrics the diameter 0 in Equation (5.3) should be replaced by the equivalent diameter 0n = 0/2. P(1) The reinforcing bars, wires or welded mesh fabrics shall be so anchored that the internal forces to which they are subjected are transmitted to the concrete and that longitudinal cracking or spalling of the concrete is avoided. If necessary transverse reinforcement shall be provided. P(2) Where mechanical devices are used, their effectiveness shall be proven by tests and their capacity to transmit the concentrated force at the anchorage shall be examined with special care. (1) The usual methods of anchorage are shown in Figure 5.2. (2) Straight anchorages or bends [Figure 5.2 a) or Figure 5.2 c)] should not be used to anchor smooth bars of more than 8 mm diameter. (3) Bends, hooks or loops are not recommended for use in compression except for plain bars which may be subjected to tensile forces in the anchorage zones, for certain load cases. (4) Spalling or splitting of the concrete may be prevented by complying with Table 5.1 and avoiding concentrations of anchorages. — for anchorages in tension, if there is no transverse compression due to the support reaction (as is the case for indirect supports, for example). — for all anchorages in compression. (2) The minimum total area of the transverse reinforcement (legs parallel to the layer of the longitudinal reinforcement) is |25l percent of the area of one anchored bar (Figure 5.3). (3) The transverse reinforcement should be evenly distributed along the anchorage length. At least one bar should be placed in the region of the hook, bend or loop of curved bar anchorages. (4) For bars in compression, the transverse reinforcement should surround the bars, being concentrated at the end of the anchorage, and extend beyond it to a distance of at least 4 times the diameter of the anchored bar [see Figure 5.5 b)]. aa is a coefficient which takes the following values: aa = 1 for straight bars aa = 0.7 for curved bars in tension (see Figure 5.2) if the concrete cover perpendicular to the plane of curvature is at least | | in the region of the hook, bend or loop. (2) If welded transverse bars are present in the anchorage, a coefficient | 0.7 | should be applied to the values given by Equation (5.4). P(1) The suitability of mechanical anchorage devices should be demonstrated by an Agrément certificate. — the width of cracks at the end of the splice does not significantly exceed the values given in Section 4.4.2.1. — laps between bars should be staggered and should not be located in areas of high stress, (see also Section 2.5.3, Analysis). (2) Clauses 5.2.3.2(1) to (4) are also applicable to lap splices. (3) The clear space between the two lapped bars in a joint should comply with the values indicated in Figure 5.4. (1) If the diameter 0 of the lapped bars is less than | 16 mm |, or if the percentage of lapped bars in any one section is less than 20 %, then the minimum transverse reinforcement provided for other reasons (e.g. shear reinforcement, distribution bars) is considered as sufficient. — the transverse reinforcement should be placed between the longitudinal reinforcement and the concrete surface. (3) For the distribution of the transverse reinforcement, 5.2.3.3(3) and (4) apply.
! = 1 for lap lengths of bars in compression and of lap lengths in tension where less than 30 % of the bars in the section are lapped and, according to Figure 5.6, where a @ | 10 0 | and b @ | 5 01.
a1 = 1.4 for tension lap lengths where either i) 30 % or more of the bars at a section are lapped or ii) according to Figure 5.6, if a < | 10 p I or b < | 5_p |, but not both. a1 = 2 for tension lap lengths if both i) and ii) above apply simultaneously. (1) The following rules relate only to the most common case where laps are made by layering of the sheets. Rules for laps with intermeshed sheets are given separately from this Code. (2) The laps should generally be situated in zones where the effects of actions under the rare combinations of loads are not more than | 80 % | of the design strength of the section. (3) Where condition (2) is not fulfilled, the effective depth of the steel taken into account in the calculations in accordance with Section 4.3.1 should apply to the layer furthest from the tension face. — 60 % if As/s > 1 200 mm /m and if this wire mesh is an interior mesh. The joints of the multiple layers should be staggered at 1.3 ls [ls from Equation (5.9)]. As/s in mm2/m ls,min = 0.3 !2 lb (@ 200 mm (@ st where st denotes the spacing of transverse welded wires. (6) Additional transverse reinforcement is not necessary in the zone of lapping. (1) All transverse reinforcement may be lapped at the same location. The minimum values of the lap length ls are given in Table 5.4; at least two transverse bars should be within the lap length (one mesh). What does available anchorage length mean? What is anchorage length of reinforcement? What is tension anchorage and tension lap? What is meant by anchorage length? Is codes for anchorage length? How to calculate anchorage length? 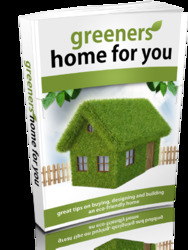 What is anchorage length eurocode? How to calculate lapping length eurocode 2? How to calculate lap length in reinforcement? What is lap length for slab? How to calculate anchorage and lap lengths to Eurocode 2? What should be the overlap length in beam? 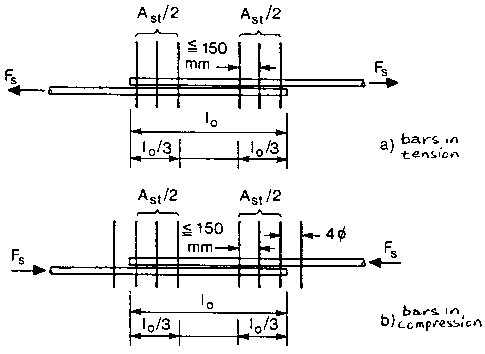 What is the anchorage length of straight bar in compression? 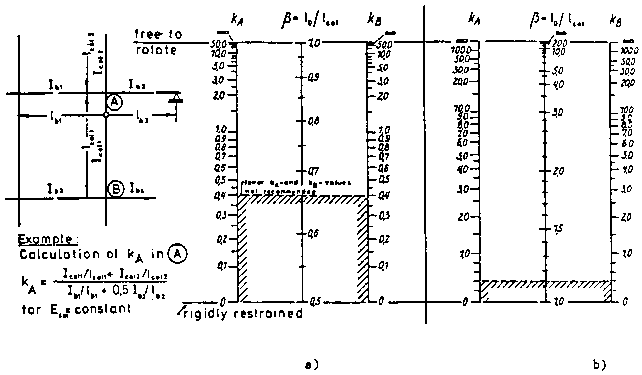 How to calculate lap length of steel? What is meant by transverse reinforcement? How to calculate lap,bond, & hook preparing bar bending? How to calculate reinforcement overlap length in picture? What is lap length in steel reinforcing? How to calculate euro code lap length? How to find lap length formula for ec2 laps? Why anchorage bond is required in concrete? What a lap lenth beams chart? 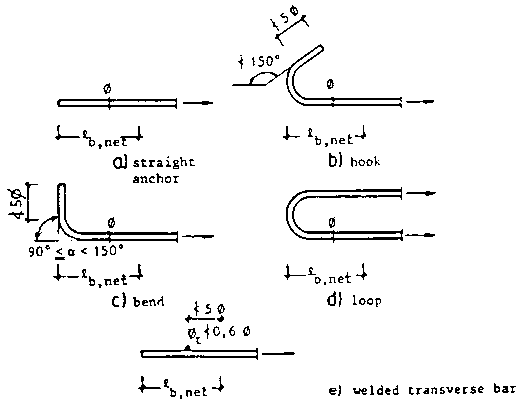 Is 1986 reinforcement anchorage length, lap length,? What is tensile zone in lapping? How to calculate the total length laping of bar tension and compression? What is the formular for steel reinforcement lap length according to euroucode? How to calculate reinforcement in perticular length in code? What the calculation in lapping a steel? What is Fbd for calculating end anchorage? How to calculate reinforcement bar lapping of thesame diameter? How to calculate the lapping distance of reinforcement bars in a column? How to find anchorage length? How to lapping for rebar silo tank? How to calculate lap for rebar in eurocodes? What is Anchorage length in slab? How do you determine the anchorage and laps of reinforcement in beam in eurocode 2? How to lap 25mm rebar in beams reinforcement? What is anchorage lenght factor? How to know length of anchorage on steel slab? Where is rebar anchorage taken from? How to calculate anchorage rebar length? How to use equivalent anchorage length eurocode? How can we calculate the anchorage length for reinforcement? What is the anchorage length of pile reinforcment? What is the anchorage length for a footing? How to fix hook bar or anchorage length?